Well today certainly continues to get more interesting with the Wall Street Journal now “officially” confirming the existence of the Google Phone. The Wall Street Journal is arguably one of the most respected new sources in the world and few would dispute their “confirmation” as anything other than concrete proof the phone exists. 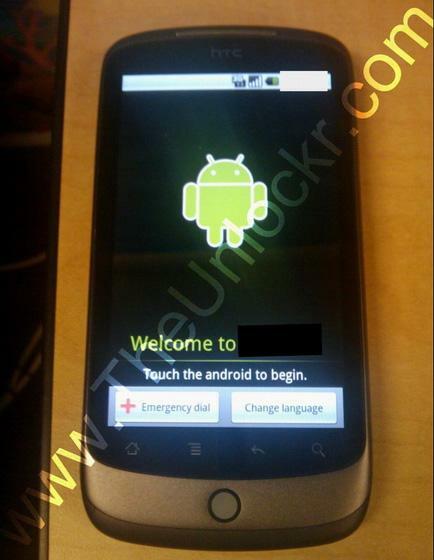 According the WSJ, the phone will be sold under the Moniker “Nexus One,” contradicting earlier reports, including our own, that HTC Passion was the launch name of the device. On the subject of carrier support, most gadget blogs are reporting the phone will be sold unlocked and available with T-Mobile and AT&T 3G bands. While we have been unable to confirm or deny sole carrier rights by T-Mobile, there was some indication T-mobile would be the exclusive carrier upon launch. Thankfully, we won’t have to long to find out all our answers to the many many questions that certainly await the now heavily anticipated launch of the “Google Phone.” However, let’s not confuse handset exclusivity with supporting the device; all signs continue to point to T-Mobile supporting this launch according to our well placed sources. It has certainly been an interesting 24 hours for the supposed Google Device and with the prospect of a phone designed entirely by Google on the horizon, hopefully manufacturers will be watching very very closely to see just what Google has in store for their very own branded cell phone. It’s going to be an interesting start to the New Year, that’s for sure. ← Google Phone That Much Closer To Realization? First off, let me apologize for saying this because this might offend some….f**k google! If they do not.bring this phone to t-mob exscusively. They walk around now(like apple) like the sh*t don’t stank. They keep mentioning the need to sell the phone themselves and not to any one carrier, but in fact it wasn’t for tmob no one would give a sh*t about ANDROID! .did any other carriers initially support them?. Let me think…….NO! google needs to do the right thing and partner with the company that in the begining brought them success( with mobile software). I understand the business aspect of things but, do the right thing- team up with tmob like you should.because google owes them.otherwise you would of bitten the hand that fed you and your softwares success. Sorry bout the rant but, I was a little pissed! . (and David-I know you feel the same but you don’t need to say so.I said it for you).I’m out! wow, it all makes sense now!! For those who thought that the project black was a stupid thing….now we are getting kickass unlocked phones, but not just that, we are getting THE google phone which only needs a good prepaid service with good prices like t-mo’s. Attaboy! that didnt take long to make the news LOL it’s an AWESOME phone feels solid in the hands. Since its built to work with any GSM carrier will it be compatible with T-mobiles 3G network? I want it if has a qwerty keyboard if not umm…i think I’ll pass. please tell me that the phone pictured is not the gphone..it doesent look that screen is bigger that 3.2″ because of that big space underneath for the touch buttons and the trackball…and if that phone pictured does have a 3.7 or bigger screen than that phone must be huge! because once u add the extra space bottom space to the size it makes it really big not pocketable.. This looks like its going to be a hot seller!!! Google Phone!!! Easy, there! If you stop to think about it, this is just the sort of thing T-Mobile seems to be shooting for. Unlocked phones that work on T-Mobile’s network are great, and if they also have AT&T’s bands, then they can use worldwide 3G too. This sort of thing is better for their business, in the long run, than a single phone exclusive, which will then be matched by a similar phone for another carrier 3 or 4 months down the line. T-Mobile can’t (or won’t) match other carriers’ advertising, so even when they have awesome exclusive deals, they don’t really seem to benefit from them. The new price plans seem to be all about flexibility and value, and an unlocked GSM Android monster seems like just the ticket. This phone dovetails nicely with all the hype of Project Dark, if this is what they were talking about, it makes a lot more sense. I’m disappointed that it doesn’t have a keyboard though. It’s crazy how the bloggers are going crazy over it, yet Tmo News has specifics on it’s release, and everyone else is ignoring the info here. I’m seeing some pretty ignorant posts all over the net, they think this phone can do ATT/TMobile/Verizon/Sprint on 3G, sigh…. I’m going to keep my G1 till a similarly spec’d phone with a keyboard shows up though. Or until the Dell MID/phone is released, and perhaps jumping to ATT’s service for it. I need qwerty. I love the Moto Droid form factor but with Google Guts. MAKE IT SO !!! !